Our past writing can keep us from writing now. We writers may feel discouraged and not write if we think our past writing was horrible. Or maybe we think we were brilliant, and we will not write because we feel we can never write that well again. Or maybe we think we are better at being typists for our cats than we are at writing our own stories. I met a writer last week, Sheila, who destroyed her past writing. 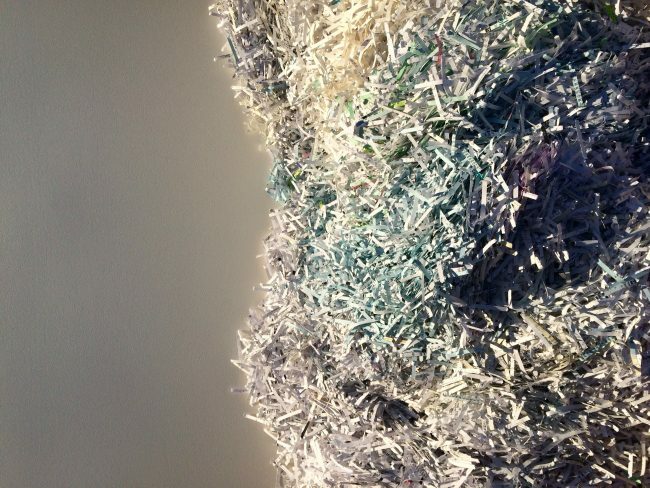 She told me she had just shredded everything she ever wrote—journals, poetry, and short stories. I asked her if she still had the shredded paper. I wanted it. We met in Valley Forge State Park by the bike trail at three o’clock. She walked over to the park bench where I was sitting in the shade. She carried only a small purse. Where is the shredded paper? Is it in her purse? Maybe she didn’t write that much? I wondered. 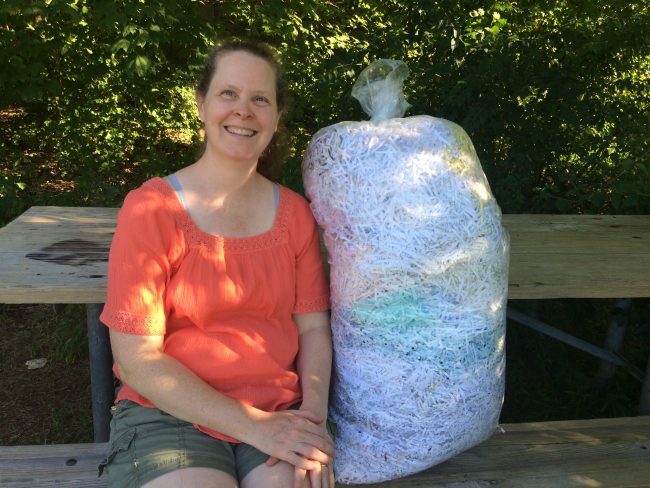 The bag of shredded paper was as large as a human torso. A bag of words, sentences, paragraphs, thoughts. Shredded. She gave me the bag of paper and then drove away. Maybe to buy a new notebook. How Much Does Your Writing Weigh? 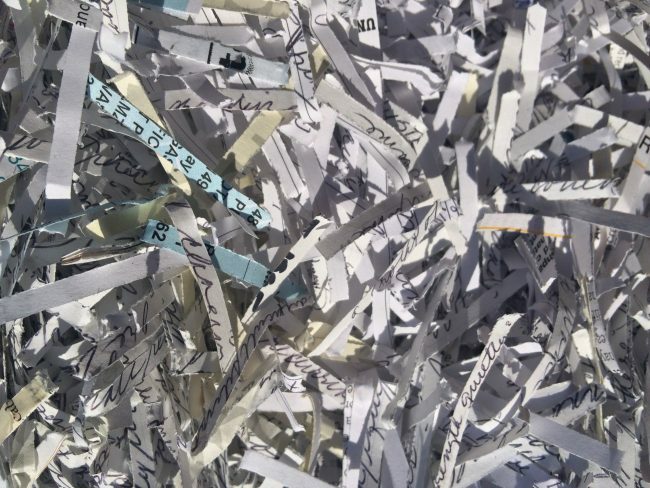 The bag of shredded writing weighed eleven pounds, fifteen ounces. The bag was 36 inches long and 15 inches wide. A long rectangle. I wanted to photograph her words. Her words became art. Shape texture. Sheila was unable to write while she still had her old writing. But now that she has let it go, she will write something new. The new writing will be different than the writing that came before. That is a good thing. The old writing was worthwhile, and the new writing will be, too. But until Sheila let herself move beyond the old writing, she could not create more. Writers change over time. Embrace this process and give yourself permission to change. Each new writing project will be different from what came before. We don’t need to destroy what we have already written like Sheila did, but we might need to find strategies to help us approach our writing differently. Give yourself permission to change. You don’t have to write the same way all of your life. I know that change can be disorienting, or even discouraging. But even as you let go of old writing so you can create new writing, remember that none of your work is ever wasted because you wouldn’t be where you are now without it. Do you need to allow yourself to change? Sheila shredded all her writing. 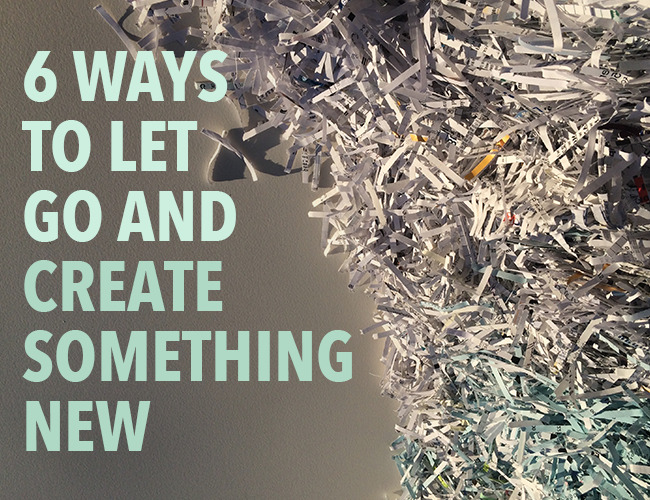 You do not need to shred all your writing if you don’t want to. Instead, try one of these strategies to get reacquainted with your writing self. If you have always written in the same chair at your local coffee shop, sit in a different chair. If you write in your closet behind your winter coats, consider writing at your kitchen table where there is better air circulation. Go to a different grocery store to buy cat litter. Or be daring and drive six hours to Niagara Falls and smell the fresh Canadian air. Write in the morning instead of at night. Write before you clean the seven litter boxes, not after. Write with a felt pen instead of on your computer. Write while listening to classical saxophone by Bryon Bellows. Bryon is my cousin. If you normally write about your cat, write about people. If you normally write children’s stories, perhaps write an adult thriller. If you usually only write a grocery list on Monday for grocery shopping on Wednesday, consider writing a short story. Instead of writing novels, write a short story. Or perhaps write a letter a friend who lives in Saskatoon, Saskatchewan, whom you really miss. You are a writer. You can write. If you didn’t like what you have written in the past—you are learning. Keep writing. If you really liked what you wrote in the past—you can do it again. Keep writing. If you loved every word you wrote in the past—edit out the words you love but don’t need. You don’t have to keep everything. Keep writing. If your past writing is keeping you from writing today—forget about it. Sit down. Write. Keep writing. Have you ever felt like your old writing is keeping you from writing now? Please let me know in the comments section. I would love to know more about your writing. Really. Write for fifteen minutes on a work in progress. Or, if you want to, write about something you have never written about before. Give yourself permission to experiment. Whatever you choose to write, when you’re finished, share it in the comments and leave feedback for other writers. p.s. What day do you do laundry? p.s.s. The Second Annual Wacky Writing Prompt Scavenger Hunt comes back on September 13th! If you have any suggestions for prompts, let me know in the comments. If I use one of your prompts in the scavenger hunt, you will win a box of 30 pre-sharpened Dixon Ticonderoga pencils because you never know when you might want to write down a story idea. And who has time to sharpen a pencil when you have an idea? Pamela writes stories about art and creativity to help you become the artist you were meant to be. She would love to meet you at pamelahodges.com.